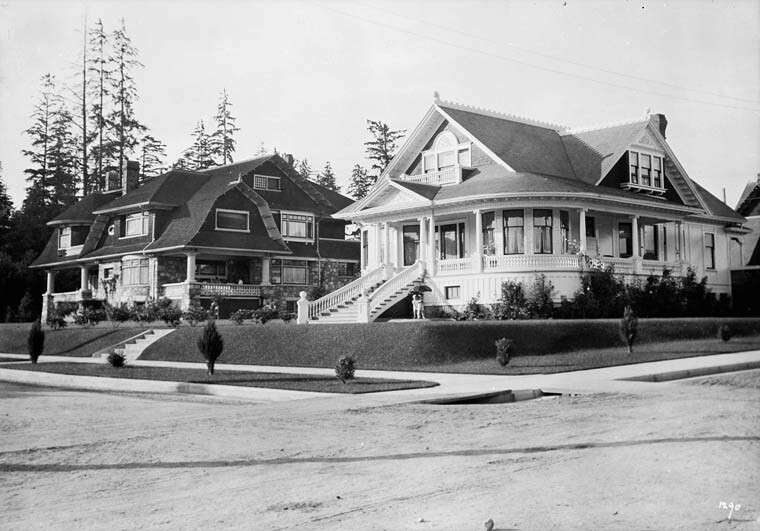 2005 Comox Street was the home of Edwin Caton Mahony. He worked for the BC Mills, Timber and Trading Company, and he designed many aspects of that company’s prefabricated buildings. One of the characteristics of these buildings was a series of vertical strips on the outer wall, about two feet apart. Between each vertical strip was a series of horizontal boards. Although the house at 2005 Comox Street had this type of walls for the main part of the building, it also had a large veranda around the east and south part of the house. 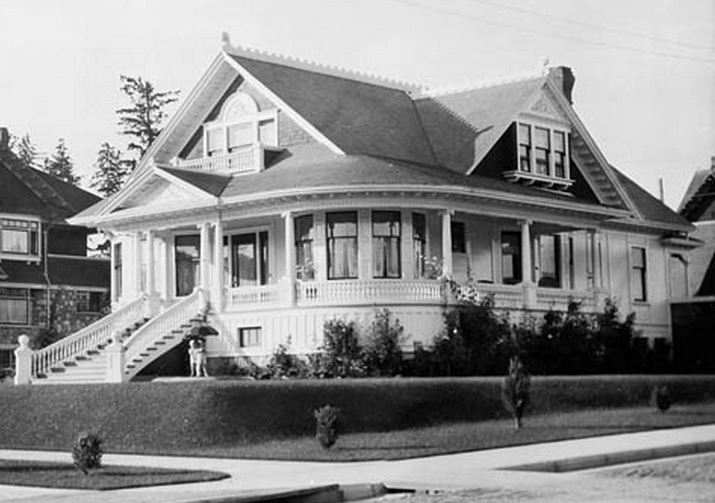 Joseph Henry Bowman (1864-1943) was the architect for this house: http://dictionaryofarchitectsincanada.org/node/1181: Comox Street, at Chilco Street, residence for Edwin C. Mahoney, 1908; demol. (inf. A.I.B.C.). Legal Description: District Lot 185, Block 69, Lot 27. 2000 Block Comox Street – Detail from Goad’s Atlas of the city of Vancouver – 1912 – Vol 1 – Plate 8 – Barclay Street to English Bay and Cardero Street to Stanley Park. 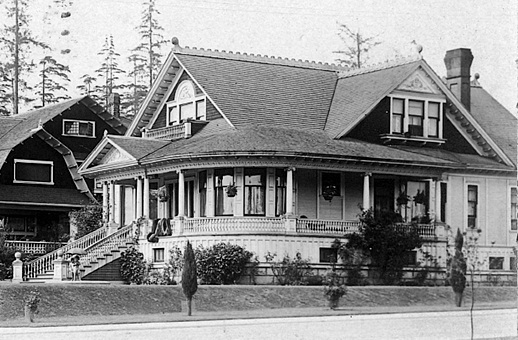 2005 Comox Street; 1913, detail from Chilco Street to Burrard Inlet to Stanley Park boundary to Pendrell Street; 1972-582.37 – Plate 62; Reference code: AM1594-MAP 383-: 1972-582.37; https://searcharchives.vancouver.ca/plate-62-chilco-street-to-burrard-inlet-to-stanley-park-boundary-to-pendrell-street. This house does not appear in the Vancouver Building Permits database: http://permits.heritagevancouver.org/ [searched January 25, 2014]. 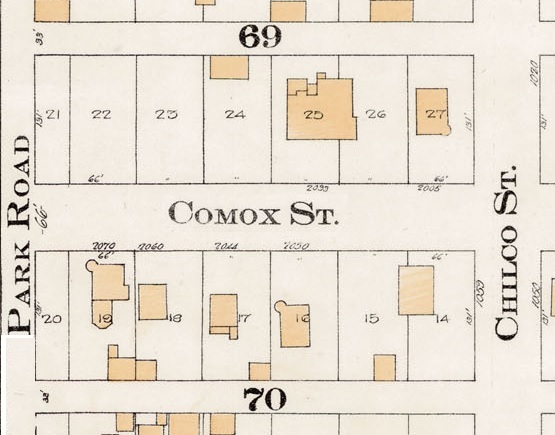 Vancouver directory listings for 2005 Comox Street from 1907 to 1924. The house later became a rooming house. Vancouver Sun, January 11, 1938, page 12, column 8. In the mid-1950s the well-known Canadian architect, Arthur Erickson, lived in this house, which he described as an “interesting pre-fab house.” He and Geoffrey Massey designed a modern apartment building to replace the old house. The demolition of the old house took place in the fall of 1956. Vancouver Sun, September 14, 1956, page 38, column 1. The new apartment building had the street address of 1049 Chilco Street, rather than 2005 Comox Street. The Residency apartment building, Jewish Museum and Archives of British Columbia; Item LF.01659; 1957; Reference code; CA JMABC A.1985.001-1-30-LF.01659; http://archives.jewishmuseum.ca/residency-apartment-building. 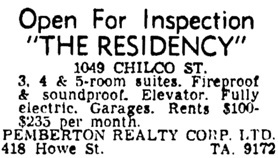 The first advertisements indicated that the individual apartments in the new building would be self-owned suites. 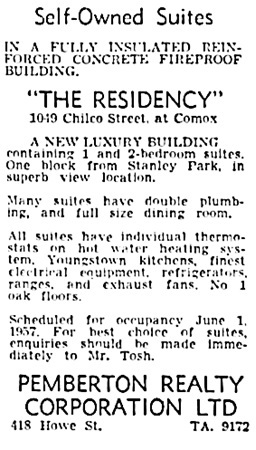 Vancouver Sun, April 11, 1957, page 35, column 6. Soon afterward, however, the building changed to rentals only. Vancouver Sun, August 16, 1957, page 40, column 2. G.E. Mills and D.W. Holdsworth, “The B.C. Mills Prefabricated System: The Emergence of Ready-Made Buildings in Western Canada,” Occasional Papers in History and Archaeology, Ottawa, Ontario, no.14 (1975); http://parkscanadahistory.com/series/chs/14/chs14-2f.htm. The Residency at 1049 Chilco Street, “Arthur Unknown,” by Danielle Egan, https://danielleegan.files.wordpress.com/2009/11/arthur-erickson.pdf [first published in Vancouver Magazine]. 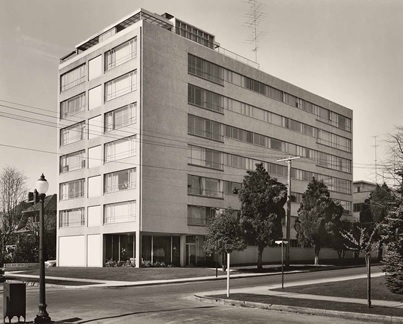 The Residency, 1049 Chilco Street, Vancouver, BC; Gateway Management; https://www.gatewayrentals.com/apartments/the-residency.